For most people, leftover pizza is either reheated in the microwave or eaten cold for breakfast. But with a little creativity, you can turn a leftover pie into another hot and delicious meal or snack. Here are just a few of the fun ways you can cook with pizza leftovers. This incredibly easy recipe is a great way to add flavor to a soup or salad. Simply stack two slices on top of each other, with the toppings in the middle. Cut them into small, crouton-sized pieces. Then, cook them for about 2 to 3 minutes on each side in a nonstick pan with heated vegetable oil. You’ll have crispy, tasty croutons. 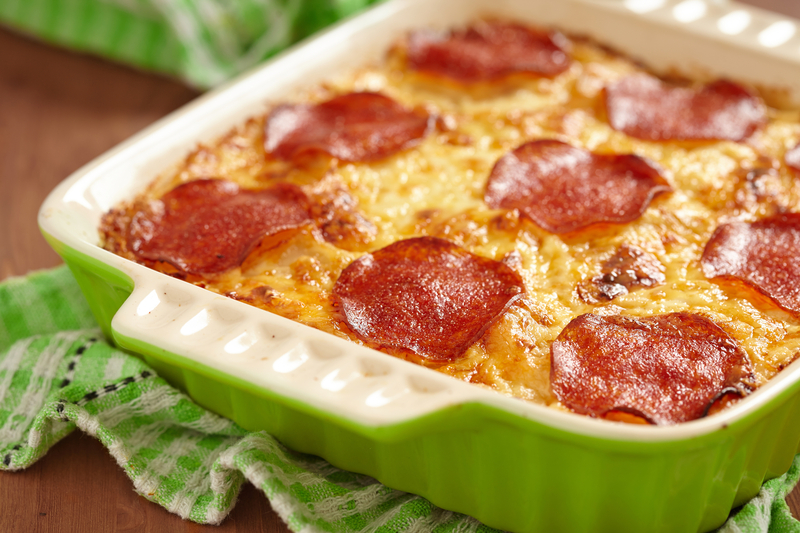 This recipe is perfect if you have a lot of pizza leftover! Start by coating a 9x13 inch pan with spaghetti sauce, then place a layer of pizza cut into strips on top of it. Blend a mixture of 1.5 cups of ricotta cheese, an egg, and healthy dashes of oregano, parsley, and salt and pepper. Layer in half the ricotta mixture. Add another coating of spaghetti sauce, as well as a half cup of mozzarella cheese and any extra meat or veggies. Add another layer of pizza slices and cover it with spaghetti sauce, the remaining ricotta mixture, and parmesan cheese. Bake at 350 degrees Fahrenheit for 45 minutes. Pizza fries are another easy recipe. All you need to do is slice your leftover pie into thin strips and bake them at 350 degrees until the pieces are nice and crispy. This will make them just the right consistency for dipping in ranch dressing, Italian dressing, or marinara sauce. If you’re in the mood for delicious pizza, wings, or burgers, make Riverfront Pizza & Sports Bar in Covington, KY, your first stop. Serving tasty treats since 1991, this sports bar hosts a casual, laid-back setting where you can watch your favorite teams play. To learn more about their menu, visit them online or call (859) 261-4800.